In the fifth bout of the day, National champion Utkarsh Kale picked up a thrilling 5-4 victory over his compatriot Shravan in the 57-kg event to send Punjab 3-2 up andin the driver's seat. 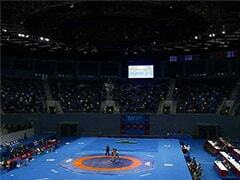 Defending champions Punjab Royals got back to their winning ways, recording a pulsating 4-3 victory over debutants Veer Marathas in the Pro Wrestling League on Sunday. Parveen Rana known for his explosive style of play, sped to an early 4-0 lead for the Veer Marathas and seemed to be cruising in the seventh and last bout of the day, with both teams tied 3-3. Jitender, however, exhibited great grit and took four straight points to level the score. He then moved to a higher gear and downed Parveen for a 7-4 win in the dying seconds to win the tie for the Royals. 2017 Asian Championship silver medalist Ritu Phogat of the Marathas overcame an initial scare to eke out a 9-7 win in the 50-kg women competition to send the tie into the decider. Although Ritu was shocked by Nirmala Devi's swiftness in the initial moments of the game, she did well to regroup and stay in the contest and pick up the crucial win for her side. In the fifth bout of the day, National champion Utkarsh Kale picked up a thrilling 5-4 victory over his compatriot Shravan in the 57-kg event to send Punjab 3-2 up and in the driver's seat. In the opening tie, European champion Ilyas Bekbulatov gave Punjab a flying start, upstaging India's national champion Amit Dhankar 8-0 in the 65-kg competition. Ilyas, stepping on the mat for the first time this season, looked rusty initially but grew in confidence to dominate Dhankar. The Russian combined his moves well and strolled his way to a big victory. The Marathas promptly clawed their way back in, with 2017 World championship silver medalist Marwa Amri of Tunisia registering a convincing 10-3 victory over Commonwealth champion Pooja Dhanda of India. Amri, who had lost her last bout, did not get the best of starts, with Pooja even winning the opening point. But the Rio Games bronze medalist got her act together to emerge victorious and help Marathas log their first win of the day. 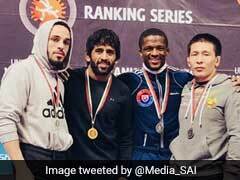 In a clash of titans, World champion Geno Petriashvili of Georgia downed Armenian Levan Berianidze 3-0, in the 125-kg category, to shift the momentum back in Punjab's favour. Both wrestlers started off cautiously with Geno taking a narrow 1-0 lead in the opening period. The scoreline did not change for the most part of the second period; but in the dying moments of the bout, Geno collected two points to seal his victory. With the Marathas trailing, their skipper Vasilisa Marzaliuk of Belarus wrestled with great determination to breeze past France's Koumba Larroque 6-2 in the 76-kg category. The Frenchwoman used all her might to pin her opponent but the World Championship bronze medalist used her experience to stay on top throughout the bout and helped Marathas pull level in the seven-bout contest.